SMUTEYE -- The guest of honor didn't have much to say Saturday, but more than 150 hungry fans lined up to savor the moment. 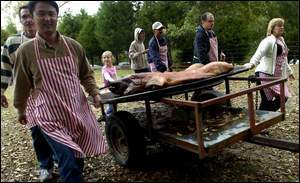 The "guest" was a 220-pound female porker and the occasion was Hog Killin' Time -- an event that dates back to the mid-19th century on the Cox Plantation. Major Cox, a descendant of the original plantation owner, resuscitated the event 17 years ago -- more than could be said for the hog. It was barbecued through the night Friday and served on an old Gulf sign platter as the sun began its descent Saturday afternoon. A highly anticipated social event, Hog Killin' Time is a way for Cox to bring friends of various racial, religious, ethnic and political stripes together for a grand old time under towering oak, sweet gum and cedar trees deep in rural Bullock County. "What we have here is a reflection of Major's philosophy on a lot of things that he is interested in," said historian Richard Bailey. "This is nothing short of amazing." Some discussed last week's mid-term election, but, for the most part, people brought along homemade potato salad, dessert and other goodies to help supplement the main course they were about to enjoy. Social activists such as the Rev. Bob Graetz and his wife, Jeannie, beamed as they watched a United Nations-like assembly before them -- a scene far removed from the time when racists bombed their house in Montgomery in the late 1950s. "This tells me it's a different place from which we left 50 years ago," said the Lutheran minister. "The only thing similar to this back then were the secret meetings when black and white people got together and hoped nobody was watching." Cox said he found the racial climate "acrimonious" at times when he returned home to stay in the 1980s, and he decided to do something about it. "I wanted to show people how to mix and socialize on a nonracial basis," he said. "You can take a look at this crowd today to see that it's working." 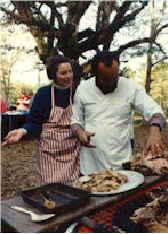 In addition to the hog, which was selected by Doris Oliveira -- an Alabama meat inspector and proud Republican -- invited guests chowed down on chili scooped out of a giant black cauldron used in the past to make syrup. Some late arrivals and an intermittent rain delayed the transfer of the hog from the barbecue pit to the serving table, but everybody quickly lined up to watch what has become known as the "Pork Procession." "The schedule is not written in stone," said Cox. "The idea is to meet, mingle and have fun. We're doing just that this afternoon." The "guest of honor" might not have been a pig in the poke, but Ken Hare and Mike Sherman poked at it for several minutes as they sliced the best part of the hog for guests. They've been sharing the honors for several years. Guests also gathered for another annual tradition -- a group photograph of everybody who turned out for the event. Cox's great-grandfather, who had the same name, held the first Hog Killin' Time in the mid-1800s to celebrate the birth of his grandson, Charles. The current Major Cox is doing it, in part, to celebrate his own birthday. He turns 66 today. He said the first Hog Killin' also was held to attract some free help to bring in the harvest. 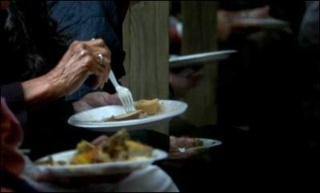 Those who volunteered got quite a meal out of it. Cox said he sent out about 300 invitations and was pleased with the response. He also said those who didn't respond might not be invited back next year. He also said he's never had to cancel any of his hog killing events because of rain because "we've always weathered the storms."